You know how time flies, right? One holiday sneaks up on you, then you blink and another one is right in your face. Well, this month I'm prepared. I'm grabbing Thanksgiving by the horns and wrangling it in. Starting November 1, I'll be sharing recipes and roundups featuring recipes fit for Thanksgiving all month long...because Thanksgiving is my favorite food-day of the entire year! Why mention that now when it's still October? Well, I'm taking advantage of this month's pumpkin theme for Progressive Eats to get a head start on November. 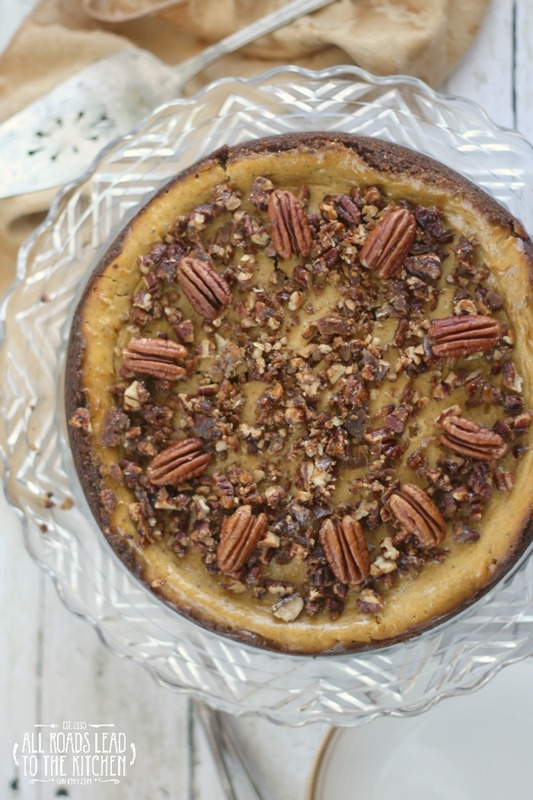 Thanksgiving and pie go hand in hand, and traditionally it's always been pecan and pumpkin pies in my family. When I got older and started making my own pies, I started adding another one or two to the mix every year. Well, this may be the year that I add a cheesecake to the mix. I decided to bake this last week and test it out on my extended family last week at my grandpa's 90th birthday celebration. Let's just say that I didn't bring a single piece home. 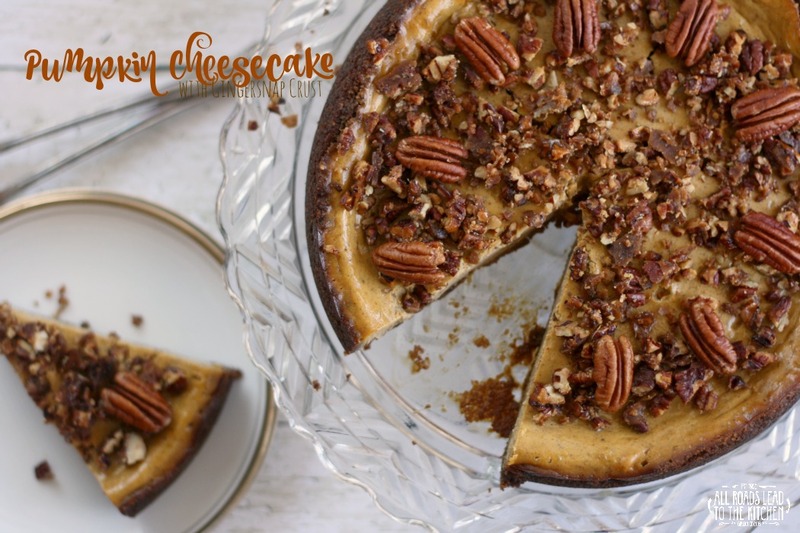 The rich, creamy, lightly spiced cheesecake filling sits perfectly atop a spicy gingerbread crust and is adorned with crunchy bits of candied pecans. I know this is practically sacrilege, but it's almost like Pumpkin Pie Plus. It tastes an awful lot like pumpkin pie...but richer and creamier. And you'll have to check back with me on this (once I've eaten it a couple more times), but it wind up replacing pumpkin pie altogether on our Thanksgiving tables of the future. 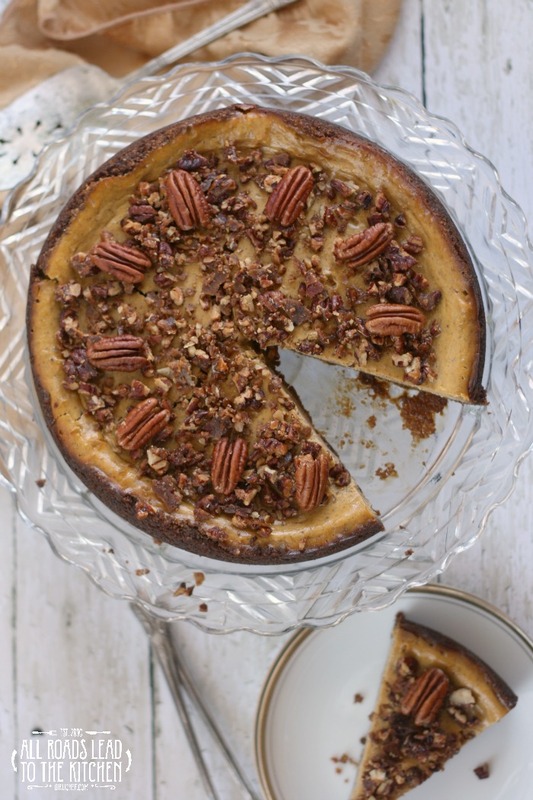 This spiced pumpkin cheesecake that sits between a gingerbread crust and a layer of candied pecans is a delicious alternative to pie this Thanksgiving. Lightly butter a 9-inch springform pan. Combine gingersnaps and pecans in the bowl of a food processor and pulse until crumbly. Add the brown sugar and melted butter and pulse a few times until it is the texture of wet sand. Pour the crumbs into the springform pan and use your fingers to pan the mixture into the bottom and about 1-2 inches up the sides of the pan as evenly as you can get it. Refrigerate for at least 20 minutes. Preheat oven to 350° F. Line a baking sheet with foil and set aside. Rinse and dry the bowl for the food processor. Add all of the ingredients for the filling to the bowl and puree until very smooth, using a rubber spatula to scrape down the sides if needed. Pour and scrape the filling into the chilled crust, smoothing the top. Set the whole thing onto the prepared baking sheet and slide into preheated oven. Bake until the cheesecake is set and a thin-bladed paring knife inserted in the center comes out clean, about 45 minutes. Let cool completely on a wire rack, removing the outside of the springform pan once you see the sides pull away. You can run a thin-bladed knife around the edge to be sure that nothing sticks first. Wrap and refrigerate until ready to serve. Set aside 10 pecan halves; finely chop the rest. Heat the butter in a small pan over medium-high heat. Once melted, add the pecans and sprinkle the sugar and a pinch of salt over them. Cook, stirring, until the sugar melts and the nuts are toasted and covered in caramel. Transfer to a piece of parchment paper and allow to cool completely. If it sticks together in large clumps, just use a sharp knife to chop it back up into fine pieces. 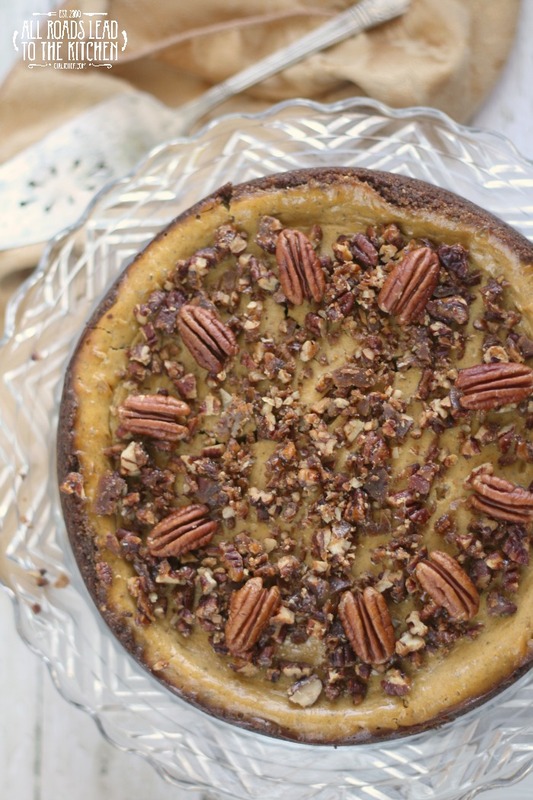 Just before serving, sprinkle the candied pecans evenly over the top of the cheesecake and arrange the extra pecan halves evenly around the perimeter. Welcome to Progressive Eats, our virtual version of a Progressive Dinner Party. This month's theme is all about Pumpkin and is hosted by Jeanette Chen who blogs at Jeanette’s Healthy Living. With Autumn’s arrival, it’s the perfect time to start using fall’s harvest in our menus. We have some great ideas this month to use pumpkins in all sorts of dishes, both Savory and Sweet. If you're unfamiliar with the concept, a progressive dinner involves going from house to house, enjoying a different course at each location. With Progressive Eats, a theme is chosen each month, members share recipes suitable for a delicious meal or party, and you can hop from blog to blog to check them out. Save on a new ECOCENTRIC MOM Box Subscription! A Devilishly Good Halloween Party! Food inspired by Film - a #FoodnFlix Roundup!